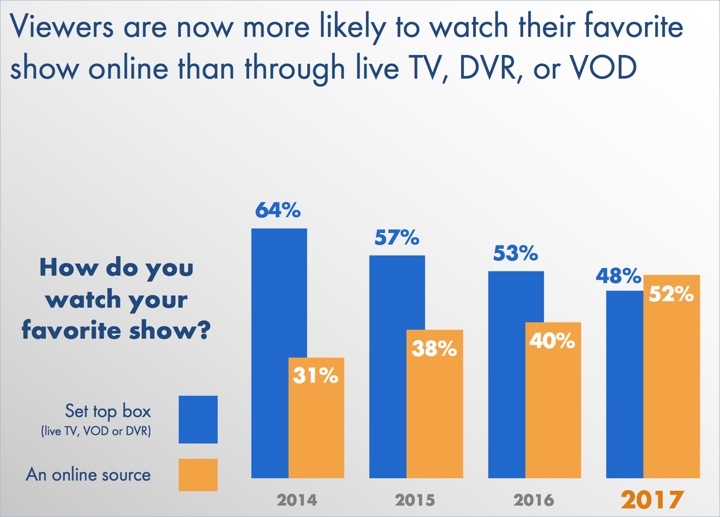 Yet another sign of how the times are changing: the new “Conquering Content” report from Hub Research finds that 52% of viewers now watch their favorite TV show from an online source rather than via a pay-TV set-top box (either live TV, VOD or DVR). Online sources include SVOD services, a TV network or pay-TV app/web site or services like iTunes. While 48% of viewers still cited their set-top box for how they watch their favorite show, that was down from 64% in 2014. Online sources as the primary way to view is up from 31% in 2014. More specifically, Hub found that 29% of viewers said they watch their favorite show on Netflix, vs. 31% on live TV. Three years ago, just 14% cited Netflix, while 45% cited live TV. Additional data highlights how meaningful SVOD services’ investments in original content has been. For Netflix, 74% of subscribers said that original content makes it more likely they’ll keep their subscription, with 67% of Hulu subscribers and 57% of Amazon subscribers saying the same. Even among non-subscribers, original content is appealing: 26%-29% of respondents said original content from the big 3 SVOD services made them more likely to subscribe. Interestingly, 70% of Netflix subscribers said that if the service stopped offering originals, they would probably or definitely still keep their subscription. That dropped to 61% for Hulu and all the way to 39% for Amazon. There’s also a big difference between how shows get discovered on pay-TV vs. via an online source. For the pay-TV, 51% of respondents cited some kind of advertisement (e.g. TV, print, online, social) for how they learned about a show compared to 22% citing word of mouth. For online it was reversed, with 26% cited an ad and 40% citing word of mouth. Hub also found that 28% of viewers already know what show they want to watch, while 21% are looking to find something new. The former attitude is more prevalent among those 35 or older, while the latter is more common for 18-34 year-olds. 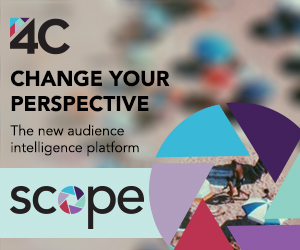 39% of respondents are actively looking out for new shows, while just 12% say they are happy with just their current shows. Netflix subscribers are more interested in finding new shows than non-subscribers. Overall however, viewers are choosy: 34% said they’ll try a new show only if they’re pretty confident they’re going to like it. Hub surveyed 2,214 U.S. consumers for the research who watch at least 5 hours of TV per day. The research was conducted in October, 2017. An excerpt of the research is available for download here.